Yay. On a lark, I entered the design contest at Popdeck. They’re a bit like Threadless, but for skateboard art. I wanted to do a deck design for my portfolio anyhow, so I thought I might as well enter it. A short while later and, look at that, it won. If you want to get your consumer on, here’s the place to do it. For those of you who are not familiar with Ceefax I will give you a quick bit of info. Ceefax system appeared on televisions across the UK on the 23 September 1974 with 30 pages. The graphics were for want of a better word 80’s and actually still are. In a time before the internet, people would buy holidays and look at weather reports in its 3 or 4 colour glory. So this image was inspired by the great and probably soon to be late CEEFAX. I just finished a tee for the upcoming Defcon hacker convention. It was a fun project where I was afforded a lot of creative freedom. The end result is a tee I’m really proud of. 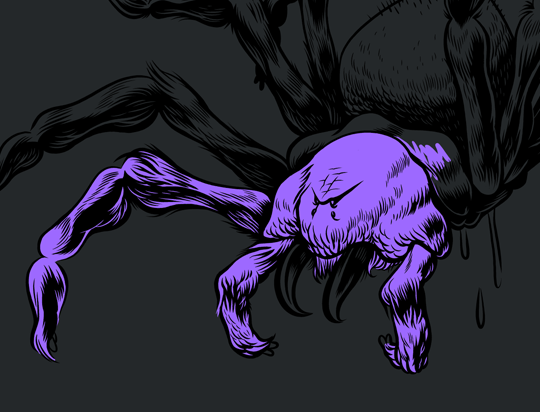 There’s a killer spider, a “web” (Get it? Har! ), and some hand lettering. What’s not to like? I’d have posted sooner, but I’ve been busier than all get out. 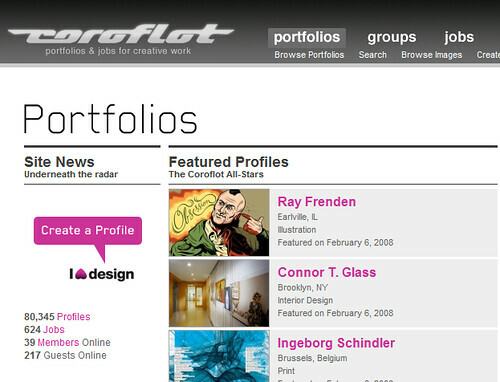 I was the featured portfolio on Coroflot for a long spell (screenshot below) and I got a heap of business as a result. If you haven’t signed up, I recommend it. It’s free and it works! In addition to Coroflot, I’m going to be signing up for The iSpot. I’ve heard good things from friends and, well, you don’t make money without spending it first. Between the postcards, iSpot, Coroflot and other sites of its ilk, and my own self promotion on the tubes, things are working out. I’m working on an Ex Libris from a comment on this very site, a magazine cover, a children’s book, and some other stuff at the moment. More on that soon! I was asked to design a little bird for NaniBird. This is a site designed by Josh McKible an illustrator and designer based in Japan. My bird which was modeled on one of the many tropical and exotic oh and semi carnivorous birds we have in Glasgow….rargh! Anyway you can go to the NaniBird website and download mine as well as other birds for free from there.